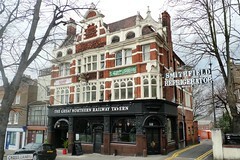 Pub in Hornsey, occupying a grand Victorian building overlooking the High Street. Note: The Great Northern Railway Tavern was acquired by Fuller's in late 2015. It reopened in April 2017 after extensive refurbishment. We haven't visited since the refurbishment, so some or all of the details below may be out of date. Many of the old decor features remain, including ornate ironwork at the entrance, engraved frosted-glass windows, leather-banquetted booths, tiling and mirrorwork. The swirling designs of the ironwork are echoed on ceiling and walls, and there's at least one stained-glass skylight. The front part of the pub is broken up by steps (and a screen) into two areas, all with a mix of table sizes. At the back is a another larger open space with more tables, some large comfy leather chairs and sofas, and impressive mirrors and antique fireplace photo. There's a beer garden to the rear of this room, with picnic benches and even a sofa. There are four handpulls on the bar. In March 2012 (when they only had two of the handpulls in place) the ales were Purity Ubu and Woodforde's Wherry; Ewan found the Ubu to be in good condition. In July 2015, the ales were Hop Stuff Single Simcoe, Northern Monk True North, King Beer Working Class Hero, and Timothy Taylor Landlord (all £3.80/pint). They also have interesting keg and craft offerings photo of the beer list as of July 2015. Staff are friendly and helpful; on our March 2012 visit they patiently answered our questions about the pub, and on our July 2015 visit they offered some very generous tasters of the ales. According to a sign on the wall in July 2015, there's a pub quiz every Wednesday. There is free wifi (ask at the bar for the network name and password), which on our July 2015 visit was fast and non-laggy. Child-friendliness: The manager has stated on Harringay Online that "families and pets are welcome". There are at least two highchairs (with low backs and no trays). On our July 2015 afternoon visit there were a couple of small children in. Accessibility: A step and a half up to get in at one door (on the left of the photo), and stepfree from there through to the toilets. The other door has only a very tiny step, but there are a couple of steps between here and the rest of the pub (including the serving part of the bar, and the toilets). Another step between the main part of the pub and the beer garden. Last visited by Kake, July 2015. Opening hours taken from the GNRT website, April 2017. Find all things on RGL within 500 metres 1 kilometre 1.5 kilometres 2 kilometres of here. Last edited 2017-04-16 06:55:56 (version 21; diff). List all versions. Page last edited 2017-04-16 06:55:56 (version 21). Site design adapted from the Creative Commons Licensed “Naturalist” by Darren Hester. The textual content of this work is licensed under the Creative Commons Attribution 2.0 licence.